Dr. Richard J. Roberts is the Chief Scientific Officer at New England Biolabs, Massachusetts. He was educated in England, attending the University of Sheffield where he obtained a PhD in Organic Chemistry in 1968. His postdoctoral research was carried out at Harvard, where he studied the tRNAs that are involved in the biosynthesis of bacterial cell walls. From 1972 to 1992, he worked at Cold Spring Harbor Laboratory, reaching the position of Assistant Director for Research under Dr. J.D. Watson. He began working on the newly discovered type II restriction enzymes in 1972 and in the following years more than 100 such enzymes were discovered in Dr. Roberts’ laboratory. He has also been involved in studies of Adenovirus-2 beginning with studies of transcription that led to the discovery of split genes and mRNA splicing, which later granted him the Nobel Prize in Physiology or Medicine in 1993. His laboratory pioneered the application of computers in the area of genome sequencing and the development of computer methods of protein and nucleic acid sequence analysis continues to be a major research focus. A major interest of his at present is the semi-automatic identification of restriction enzyme and methylase genes within the GenBank database. Using PacBio sequencing it is now possible to determine complete methylomes for bacteria and this is leading to the discovery of many novel enzymes. Most recently, he became one of the leaders of the COMBREX project, which is concerned with the functional annotation of prokaryotic genomes. 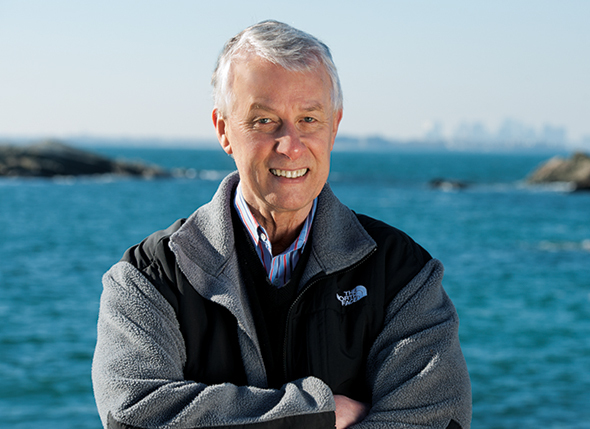 Richard Roberts is the Scientific Director of the New England Biolabs. There, he develops a new technique about genetic sequencing, named PacBio. The goal of his study is to know more about the bacterial methyloma: type I, II and III restriction enzymes and methylase proteins, based on the bacterial model. FRONTAL: As far as we are concerned, your academic training first directed you to become a detective. Looking back to everything you have done, do you think you have accomplished that old wish of yours? Richard Roberts: Well, of course. When I originally thought I would be a detective, I had in mind police work rather than what I do, but in fact what I do is a detective work. So, I think yes, I have. F: We believe that your family, namely your father – who built you a laboratory – played a significant role in your decision of choosing the career of Chemistry. What about from there to Genetics, what was the “big push”? RR: I liked Chemistry, and when I was doing my PhD, I was lucky enough to get all the results I needed for my PhD in one year, because in England you have to do three years for your PhD, and I had two years to really play around; one of those years was a lot of reading and I read a book called The Thread of Life, by John Kendrew, which was about the early days of Molecular Biology. By the time I had finished the book, I knew that I wanted to be a molecular biologist. F: What was it like to work with Dr. Watson, the father of the DNA model we all know? Do you feel as if you were part of the family that discovered modern Genetics? RR: That’s a very difficult question. Jim Watson is a very difficult man to work for; I didn’t work with him, I worked for him. And it was ok… eventually. Am I a part of molecular biology discovery? Yeah, sure, I am! F: What does a scientist need to be a complete man, a complete human being? RR: Well, probably being a husband better than I am, so I think one of the problems is that to be good at Science you really have to put your heart and soul into it, and it takes a lot of time because I have a very obsessive-compulsory kind of personality: as soon as I get interested in something, all I want to do is keep doing it, and doing it, and doing it… And that’s very hard for the family sometimes; my wife is constantly trying to convince me that I need to do something out of the work. She thinks of it as work, but I don’t think of it as work: I love what I do, so I see this as my hobby. I do my hobby all the time. Artigo anteriorSerá a Defesa o Melhor Ataque? Próximo artigoPorque protestam os médicos?